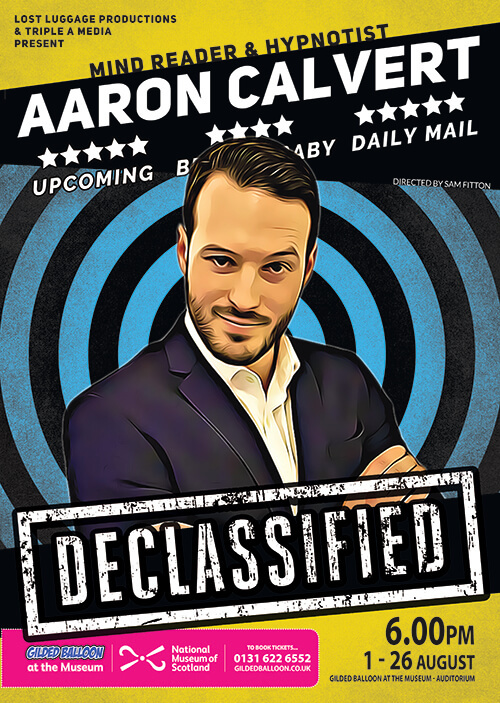 Aaron Calvert: Declassified is on at the Gilded Balloon at the Museum – Auditorium, during August. What is your Fringe show about? How many times/many years have you appeared at the Fringe? I’ve performed at the Edinburgh Fringe Festival for the last two years and I’ve been overwhelmed by the response to my shows, both by audiences and reviewers alike. With both ‘Mind Games’ and ‘Awaken’ I’m proud to say I packed-out the largest Free Fringe venue for 22 days straight in 2016 & 17, filling over 200 seats every single day. This year I’m excited to say we decided to take the show to the perfect venue, with a bigger stage over at the Gilded Balloon at the Museum. I really can’t wait to see what this year has in store. What’s your most memorable moment from the Fringe? My first year at Fringe I became absolutely star struck during a show. I remember looking out into the audience and seeing Michael Caine sat in the second row of my show. I couldn’t believe it, it took me a good few moments to regain my composure. Towards the end of the show I found a moment to invite Michael to choose a volunteer. Much to my disappointment it turned out to be a Scottish man named Doug who I’d met on a train to London 6 months earlier. Twice I’ve been fooled by Sir Michael Caine’s doppelgänger. What’s the worst thing about the Fringe? I actually find the worst thing about Fringe are the months leading up. Most people probably don’t realise that the show represents years of working on the overall concept and at least the last 6 months of my life writing, rehearsing and previewing the show. There’s so much to consider from advertising to ticket sales, you have to be able to ‘do everything’. It’s February, you blink and it’s August… But then the first day of Fringe comes, and all of the stress, worry and anxiety is instantly forgotten the moment I walk out on stage. If you were not a performer what would you be doing? I’d probably be a doctor. I spent half a decade training at the University of Nottingham’s medical school and after qualifying I had a huge decision to make; become a doctor with job security and the respect of my parents, or become a mind reader and hypnotist. I think my parent’s are still baffled by my decision. So if I wasn’t a performer I’d probably be working in a hospital, ideally somewhere sunny, working long days for very little pay. Wait a minute, that sounds pretty much like Fringe, just without sunny Edinburgh skies. Preparation for a performance starts months before. It normally consists of caffeine fuelled days with co-writer Sam Fitton and hundreds of notes scribbled on paper. Eventually a show comes together and I start rehearsals, by which I mean speaking to myself in an empty room. That’s the trouble with rehearsing a show that relies on audience participation, without an audience I really can’t rehearse. This makes stepping out on stage so exciting, I don’t exactly know what’s going to happen. That’s why back stage Sam & I distract each other with silly games right up until show time, it keeps nerves to a minimum. Favourite thing about being in Edinburgh? I absolutely love Edinburgh. I fell in love with the city when I first visited it in 2013 seeing a performance at the wonderful Edinburgh Playhouse. The moment I set foot in Edinburgh I wanted to live there. The streets, the architecture, the atmosphere, to be honest everything about it fascinated me. It’s why I love Fringe, I get to spend a month in my favourite city, I always come up early to enjoy the calm before the storm that is Fringe, but I do love how alive the city becomes once the chaos starts. What’s the most Scottish thing you’ve ever done? The most Scottish thing I’ve done is donned a kilt in the true Scotsman way for one of my Grandma’s birthday parties. She was Scottish, born in Kirkubury, I had a kilt made in her family MckIe tartan. I turned up in the kilt as a complete surprise and she loved it. She hadn’t seen the McKie Tartan since she was a wee girl. Sadly the wind did want to get in on the action and gave everyone a full frontal look at my pipes… luckily it was in the days before camera phones really became a thing. Irn Bru is top of the list for me. As my Gran was Scottish she practically brought me up on the stuff, ‘cures any ailment’ she would claim. It’s still a go to drink for me now when I see it across the boarder in England. I will admit I have tried haggis I can honestly say it’s not for me. Deep fried Mars bars on the other hand, count me in! What if all the stories you heard were true? Urban legends contained within declassified files are recreated live on stage by master hypnotist Aaron Calvert.